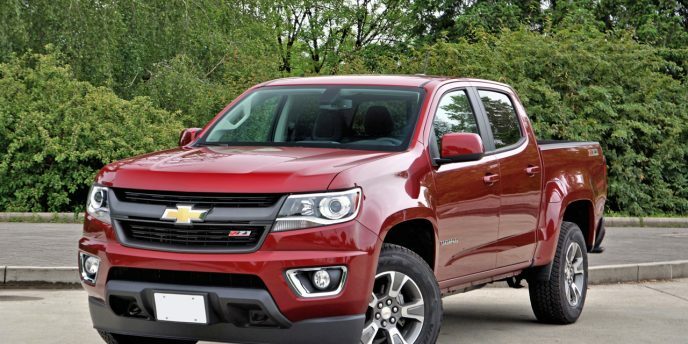 Which would you rather have, one of Chevy’s ultra-rugged off-road racing replica Colorado ZR2 pickup trucks with its standard V6 or with its optional diesel? We tested both, using just its default rear-drive 4×2 mode on pavement, across some fast-paced gravel roads in 4WD high, and lastly with its 4WD-low gear-set engaged in the dirt and sloshing through some thick winter mud with a bunch of hip-wader-high puddles thrown into the mix. The diesel-powered version was actually last year’s truck that we decided to cover in one review now that our V6 gasoline-fueled model arrived, allowing us to tell you about all the changes Chevy has made to this 4×4 beast as part of its 2019 model year changeover. Of course, this is a niche vehicle that won’t be to everyone’s taste, but the updates affect the majority of Colorado and GMC Canyon models, so it won’t matter whether you’re choosing one of the General’s mid-size pickups for work or for play. Along with its off-road prowess the 2019 Colorado is better for everyday use too, thanks to a new larger 8.0-inch infotainment touchscreen in all trims except for the base WT (Work Truck) that still does pretty well with a new 7.0-inch main display. The larger of the two boasts beautiful HD graphics and even an HD backup camera, which we’ll make sure to comment on in our upcoming road test review. Our ZR2 tester even includes a wireless smartphone charger, this feature standard with Z71 trim and above, while all trims include a new smaller Type-C USB port next to the conventional USB-A connection. These are located on the front centre console, next to an auxiliary input jack and an available SD card reader. Additionally, a second microphone mounted closer to the front passenger improves Bluetooth hands-free voice quality, while we really like the ZR2’s heatable steering wheel rim, this now standard on all trims above the LT. 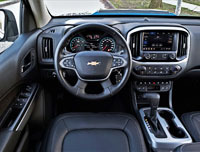 I won’t bore you with all the ZR2’s comfort and convenience features, which are readily available on Chevy’s retail website or at CarCostCanada where I sourced all the 2019 Colorado’s pricing information including trims, packages and standalone options, not to mention money-saving rebate info and dealer invoice pricing, but suffice to say it’s very well equipped for just $46,100 plus freight and fees, albeit more focused on off-road prowess than pampering one’s backside. 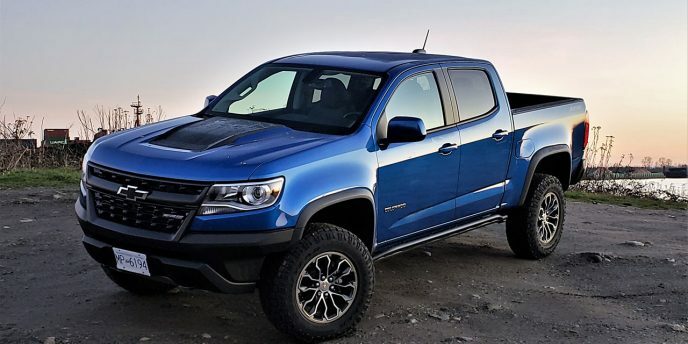 Like the 2017 and 2018 Colorado ZR2, this new one gets a substantial boost in ride height and therefore ground clearance that’s up by 50 mm (2.0 inches), while any negatives to high-speed handling are offset by a 90-mm (3.5-inch) increase in front and rear track, new stiffer cast-iron lower front control arms, and special 8- by 17-inch alloy wheels cushioned by 31-inch Goodyear Duratrac off-road rubber. Handling off the beaten path, particularly improving suspension articulation is a new 1.0-inch-diameter solid anti-roll bar replacing the usual 1.5-inch hollow one, while leaving the best for last are special Multimatic shocks designed for cushioning the otherwise jarring impacts of rocks, roots and other obstacles you might find along an ungraded back road or trail. Easier to see are skid plates below and tubular rocker extensions at each side, both designed to protect vulnerable components and bodywork, but the ZR2 is even more noticeable to passersby thanks to its all-business matte black grille and even beefier black hood dome that serve no purpose but looking good, rugged black bumpers that get chopped down a couple of notches to improve approach and departure angles, and muscular black fender flares that make way for those meaty tires just noted. Between the front wheel wells of this $495 optional Kinetic Blue Metallic painted truck is the standard 3.6-litre V6 that’s good for 308 horsepower and 275 lb-ft of torque, the latter from 4,000 rpm, driving the rear axle or both via part-time four-wheel drive and an efficient eight-speed automatic transmission. The combination gets a claimed 15.0 L/100km city, 13.0 highway and 14.1 combined fuel economy rating, thanks in part to cylinder deactivation under light loads. The Deepwood Green Metallic coloured truck (it looks grey), the optional colour discontinued for 2019, mates GM’s wonderful 2.8-litre Duramax turbo-diesel four-cylinder, good for 181 horsepower and a best-in-class 369 lb-ft of torque from just 2,000 rpm, to a less advanced yet still very capable and arguably more robust six-speed automatic gearbox, which come together for a much thriftier 12.5 L/100km city, 10.7 highway and 11.7 combined rating, which might not be enough fuel economy gains to justify its considerable $4,090 upgrade unless you happen to put a lot of distance between trade-ins, or require the diesel’s much improved efficiency to travel deeper into the woods than gasoline-powered truck owners dare tread. 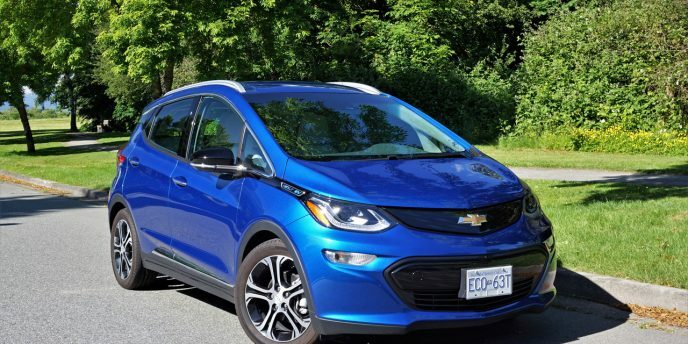 Surprised that Chevrolet's new Bolt EV is the best-selling electric vehicle in Canada? It actually hit number one before 2017's halfway point, and for good reason. Tons of advertising! Sorry, I couldn't resist that. While partially true the umpteen millions Chevy has spent promoting its newest EV is hardly the main reason it's succeeding. More importantly, the Bolt fully lives up to all the hype being lauded upon it by the bowtie brand itself, industry pundits like me, and now customers aplenty. How many customers? At the close of November it had accumulated 1,292 paid followers in Canada, and while Tesla Model 3 buyers might scoff at such a puny figure, it's exactly 1,292 more deliveries than Tesla's Model 3 over the same 11 months. I'm officially on the bandwagon. OK, more specifically I'm standing on the cargo bed of General Motors' superb new Chevy Colorado because its segment-exclusive CornerStep bumper makes it so easy to climb up to. Seriously though, this mid-size truck and its GMC Canyon counterpart are now best in class by a large margin. They've got styling, performance, efficiency, interior design and execution, infotainment excellence, and yes those brilliant rear bumper steps going for them. And I haven't even mentioned the all-new 2.8-litre Duramax turbo-diesel yet. 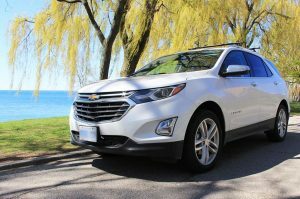 The brand new completely redesigned 2018 Chevrolet Equinox looks great in it’s top-tier Premier trim. The all-new 2018 Chevrolet Equinox is here and we have it in our garage. Past models have sold relatively well in the small SUV category. Canadian consumers bought 19,197 Equinox utilities in 2016, and over the course of its 13-year tenure upwards of two million have been sold in North America. It faces stiff competition in the compact crossover market going up against the bestselling Toyota RAV4 that sold 49,103 units last year. Other competitors in the Equinox’ class include the Ford Escape, Honda CR-V, Nissan Rogue and Jeep Cherokee. The Equinox finally received a much-needed redesign from its tired second-generation model that’s been in production since 2009. The grille is more aggressive and trimmed in chrome while the LED headlights have gone from rounded and cute to sharp and sporty. The front fascia looks like it’s taken athletic styling cues from the other cars in Chevrolet’s lineup such as the Cruze, Malibu and Volt. The entire car has been aero-tested in a wind tunnel and it shows. Subtle sculpting in the Equinox’ side paneling make it an interesting vehicle to look at. The changes don’t stop with aesthetics. The new Chevy weighs 204 kg (450 lbs) less than the previous model at 1,509 kg (3,327 lbs), which results in better fuel economy and acceleration, but we will get to that in the full review. The wheelbase is 2,725 mm (107.3 inches) long, 132 mm (5.2 inches) shorter than the previous model 2857.5 mm (112.5 inches). A shorter wheelbase results in the car being, you guessed it, smaller. The 2018 Equinox is 119.4 mm (4.7 inches) shorter in overall length than the previous model at 4,650.74 mm (183.1 inches). 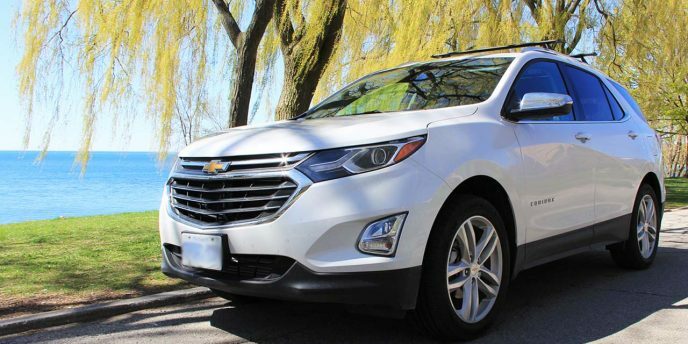 The cargo capacity is slightly down from the 2016 Equinox but it doesn’t affect the amount of room for passengers. The second row has ample space and can comfortably seat three adults abreast, although the headroom in the back row is slightly cramped at 937 mm (36.9 inches) with a sunroof. Up front the driver’s seat is fully changeable with eight-way adjustable, upwards of six feet I found no issue with the head room and was pleasantly comfortable. The third-generation Equinox comes with a choice of three engines. The first is a 1.5-litre turbocharged four-cylinder that produces 170 horsepower at 5,600 rpm and 203 lb-ft of torque at 2,500-4,500 rpm. The second engine is a 2.0-litre turbocharged four-cylinder, which produces 252 horsepower and 260 lb-ft of torque. The last is a 1.6-litre turbocharged diesel four-cylinder engine that develops 136 horsepower and 236 lb-ft of torque. Responsive? Come back and read the full review to find out what it’s like to drive. This Equinox in our garage has the 1.5-litre turbocharged engine paired to a six-speed automatic transmission with manual shifting mode. The engine has auto start/stop feature to enhance fuel efficiency. 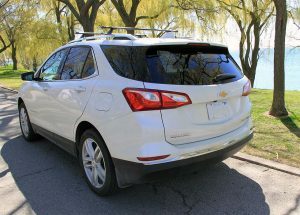 Along with the broad and varied engine lineup the 2018 Chevrolet Equinox also comes with four trim levels including the L, LS, LT and Premier with all trims available in front- or all-wheel drive. Our tester is finished in top-line Premier AWD trim, which comes with an array of features such as, 19-inch ultra bright machined wheels with sparkle silver pockets, body-colour door handles with chrome strip, chrome mirror caps, chrome roof-mounted side rails a power sunroof, fog lamps, a power tailgate, rear park assist, leather-trimmed upholstery, remote start and heated front seats. The Equinox comes loaded with technology and a very user friendly touch screen interface. On top of Chevy’s Premier trim the tester also features a $5,965 True North Edition package that comes with Chevrolet’s impressive MyLink infotainment system that includes an eight-inch colour touch-screen display with navigation, SiriusXM satellite radio, Bluetooth with A2DP streaming stereo audio, Apple CarPlay and Android Auto, wireless charging capability, USB integration and OnStar 4G LTE Wi-Fi connectivity. The Equinox is extremely well equipped with advanced safety features such as forward-collision warning, lane-departure warning, lane-keeping assist and automated low-speed braking. 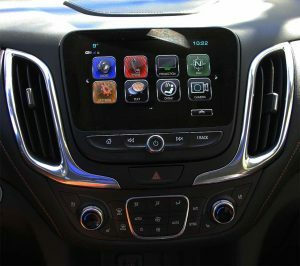 The Chevy is also loaded with sensors and cameras that provide more safety features such as blind-spot warning, rear cross-traffic alert, rear park assist, rearview camera, and a bird’s-eye view of your perimeter. For parents there is also a “Teen Driver” system that sets speed warnings and limits the maximum volume for the audio system. Additionally, it delivers a “report card” that parents can view to see how their teen is driving. Come back to read the full road test review, at which point we’ll fill you in on the new SUV’s overall practicality, economy, and safety features, as well as what it’s like to drive. 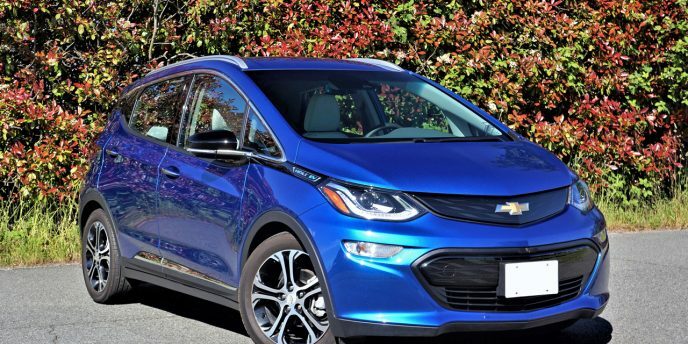 It should come as little surprise that Chevrolet’s new Bolt EV is now the best-selling electric vehicle in Canada. It went on sale in January and has accumulated 697 buyers, although according to one of my local dealers that’s been turning away potential customers regularly, they could’ve sold many more if any were still available. Nissan’s slightly larger Leaf was second, by the way, selling 586 units during the same five months (still respectable considering its age), while the Tesla Model S found 397 buyers, that brand’s Model X another 372, BMW i Series 156 (mostly made up of i3s, but marginally boosted by the i8 supercar), and Mitsubishi lured in 29 new i-MiEV owners (that’s it for available EV sales numbers). Of note, the Bolt has been available south of the 49th since December of last year when it accumulated a considerable 579 sales, but over the first five months of 2017 it’s managed to garner more than 10 times that amount with 5,950 units down the road. In comparison, the Tesla Model S walked away with the EV sales crown with 8,900 sold during the same time period, followed closely by the brand’s new Model X at 7,000 units. The more directly comparative Nissan Leaf found just 5,742 American buyers during the same five months, while the more comparably sized and shaped BMW i3 sold 1,919 units. Almost taking up the rear was Mercedes’ B250e with 271 sales, a pure electric not available here (but they don’t get the gasoline-powered B-Class), while dragging its tail (is it technically still available?) was the i-MiEV with 6 sales. Either General Motors underestimated the demand for its little subcompact plug-in or they just don’t have the capacity to build more at their Orion Township, Michigan assembly plant, where they also produce the Euro-spec version dubbed Opel Ampera-e, as well as the Chevy Sonic (that’s similarly sized albeit built on the new BEV II platform architecture instead of the Sonic’s Gamma II). GM may want to cut back production of the Opel Ampera-e now that they’ve sold off their European division (it’s doing especially well in Norway) in order to support their North American markets more, or even better they could turn that soon to be phased out model into a Buick Bolt and build/sell it in China where EVs are taking over city streets, and then bring it back here like they’re doing with the Envision compact SUV, but with a new name, a few Buick styling tweaks, and a fancier interior. See, I’ve got it all sussed out. GM just needs to give me a call to sort out the details. If it were only so easy, but the General is certainly on the right track with its new Bolt. 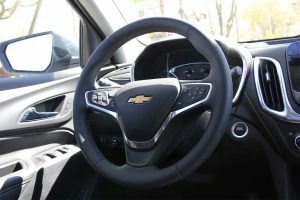 In fact, one of the reasons GM’s stock price has risen over the past month, year, and five-year intervals, and Ford’s has been on the decline for all of the above (except the five-year), is its success in the plug-in arena, first with the Volt, the number one selling PHEV period, and now the Bolt, which could very well zip into the top North American sales spot once availability matches demand. And no, I’m not about the digress (too far) into the upcoming Tesla Model 3 despite presales humbling any current or past EV, because it’s not yet available and may not be for some time. Of course, most of us are hoping it will succeed, as Tesla is a modern-day success story that’s truly shaken the old guard to its knees (especially on the markets, where real-world results aren’t as important as “fingers crossed” projections), so we’ll cross that bridge (hopefully while driving a Model 3) when we come to it. The Bolt EV is in the here and now (or at least it was before selling out—talk to your Chevy dealer as I know there’s at least one available in the near future, and it’s sitting in my driveway), and can be had for $43,095 before freight and dealer fees, discounts (good luck with that), and government rebates (up to $5,000 in BC, $14,000 in Ontario, and $8,000 in Quebec). I know that price is mighty close to BMW’s i3, but despite the Bimmer’s near F1-tech levels of carbon-fibre construction, better handling, mostly nicer finishings inside, and that all-important blue and white roundel, it’s not in the same EV class as the Bolt, at least if the main goal is going as far as you possible can on a single charge, and hardly worrying one whit about how much throttle you use getting there.